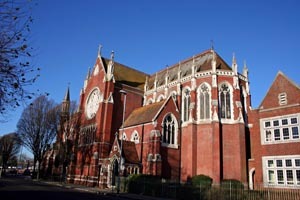 Located in Portsmouth city centre, close to Victoria Park, is the Catholic Cathedral of St John the Evangelist. This is the mother church of the Diocese of Portsmouth and the seat of the Bishop of Portsmouth. The building is 19th century French Gothic in style and was designed by John Crawley. The Catholic community in Portsmouth numbered around 150 people in 1791 but had expanded to over 1,000 by 1830. A chapel was built in Portsea in 1796 but proved to be too small, it was expanded in both 1851 and in the late 1870's. This was due to the increasing local Catholic population, but also due to the large numbers of catholic soldiers housed in the Portsmouth garrison. Land for a larger church was purchased from the War Department in 1877. The land had become available when the redundant defensive ramparts around Portsea were demolished, this also made land available for the Corporation to build Portsmouth's first "peoples park", now known as Victoria Park, just across the road from the Cathedral. John Crawley won the competition to design the new church in 1877, but he did not see the building completed, dying just two years after the building work started in 1879. Crawley was replaced by Stanislaus Hansom, whose father Joseph was the designer of the Hansom Cab. Crawley's original design had included a tall spire, but geological and structural problems lead to this being abandoned. The building went ahead as planned but without the spire. The church is built in the French Gothic architectural style, having a circular apse, a semicircular recess covered with a hemispherical vault or semi-dome, and is constructed from red Fareham brick and Portland stone. Initially only the first five bays of the church were built due to lack of funds, a temporary wall was built at the eastern end. The new diocese of Portsmouth was created in May 1882 by Pope Leo XII, originally the town was part of the diocese of Southwark. The church opened on the 9th August 1882 as the cathedral of the newly formed diocese, John Vertue was the first Bishop. The crossings, transepts and side chapels were built next, with the chancel and apse being completed in 1893. In 1900 Bishop Vertue died, the building was completed in 1906 under the supervision of Bishop Cahill, when the narthex (entrance or lobby area), porch and turrets were built. Also at this time the baldacchino (an architectural canopy over the altar), and altar were moved into the chancel in front of the screen. The baldachinno was later removed in a reordering of the Cathedral in 1970. During the second world war Portsmouth was very heavily bombed during The Blitz and suffered extensive damage from conventional and incendiary devices. St John's was badly damaged during the air raids in 1941, all of the original stained glass windows except one, the Dean's window, were destroyed or badly damaged, the Bishop's house next door was totally destroyed. The cathedral's windows were restored during the 1950's by Aurthur Buss. The window in the north transept is designed to commemorate the Second Vatican Council and the centenary of the diocese. The great east window shows the Holy Trinity surrounded by the host of heaven and the great west window is divided into three sections with decorative tracery, the window sections depict St Swithun, St John the Evangelist, Our Lady, St Edmund, St Joseph and St Wilfrid. 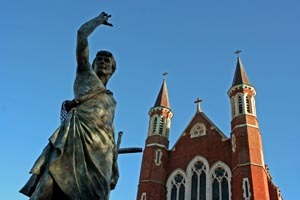 The statue of St John the Evangelist was unveiled on the 22nd July 2010, the statue which is eight feet high, is by the same sculptor, Philip Jackson, who produced the iconic "The Yomper" which stands outside of the Royal Marines Museum at Eastney. Cathedral of St John the Evangelist - Portsmouth. At the back of the Cathedral, go through the car park, is the Discovery Centre a multi-functional centre which sells a wide range of Christian books, hosts catholic educational courses for schools and parishes and has a coffee shop selling Fair Trade products, soups and snacks.